Charlotte Flair versus Ronda Rousey is the new favourite in a betting market where Kambi customers can place wagers on the bout they think will headline WrestleMania 35. I wrote about the market last Sunday in the hours leading up to WrestleMania 34. In the post, I noted that Rousey versus Asuka was a 6/4 favourite and I had a bet on it. I later regretted the bet after witnessing Asuka fail in her quest to defeat Charlotte Flair for the Smackdown Women's Championship and - as a result of this - lose her undefeated streak. In this week's issue of the Wrestling Observer Newsletter, Dave Meltzer noted that there has been talk of Flair versus Rousey being the main attraction for next year's event in New Jersey, so it's understandable to see the match moved from 5/1 into 1/2. Last week's fave has been pushed out to 4/1. You can view all the latest odds, and their previous numbers, in the table below. It wasn't only the potential Charlotte Flair .vs. Ronda Rousey match that has been cut. Others to move down are Daniel Bryan .vs. Shinsuke Nakamura (3/1 to 2/1), Daniel Bryan .vs. 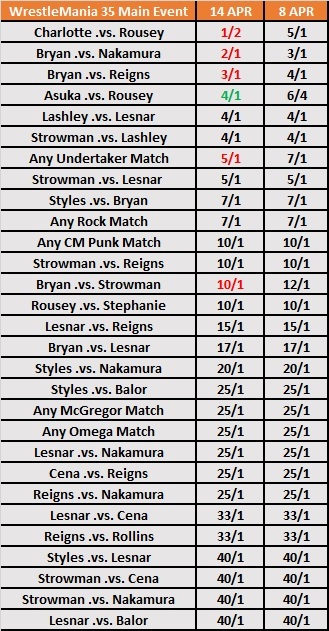 Roman Reigns (4/1 to 3/1), Any Match Featuring The Undertaker (7/1 to 5/1) and Daniel Bryan .vs. Braun Strowman (12/1 to 10/1). All bets will be settled on the final match at WrestleMania 35 on April 7th 2019.